There are many people all over the world focused on the results of the U.S. election. Because my business, and a large part of my life focuses on helping people all over the world pass the TOEFL ibt, anything that affects my students, affects me. 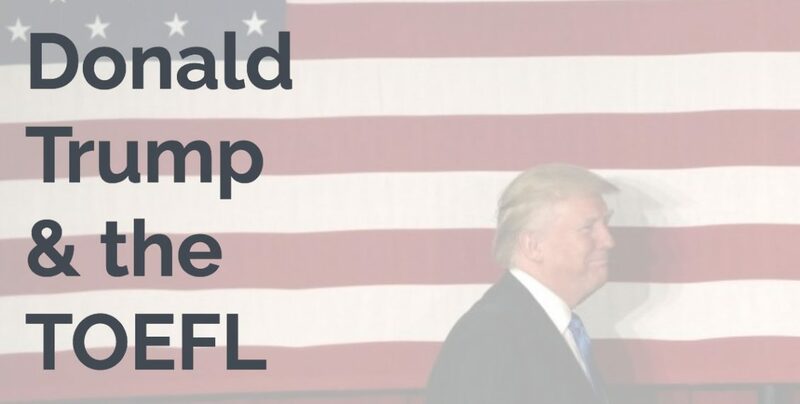 We researched the most current information on how the new President elect Donald Trump and the TOEFL are related (President “elect” means that he will be President, but he isn’t President yet), and how Trump’s policies might affect people who need to take the TOEFL ibt. Read below to see how the results of the U.S. Presidential election affects you. As you probably know, you need a student visa to study in the United States. Your course of study and the type of school you want to attend determine whether you need an F-1 visa or an M-1 visa. For short periods of recreational study (just for fun and interest) you can enter with a B visa, however this usually doesn’t apply to TOEFL exam students. There are also J-1 visas that cover educational and cultural exchange programs “designated by the U.S. Department of State“. I want talented people to come into this country—to work hard and to become citizens. Silicon Valley needs engineers, etc. It’s important to note that Donald Trump is not consistent with his statements, and a lot of his policy claims change on a regular basis. That being said, in the end it is very difficult to make major changes to the United States law structure, and there are many businesses and Universities in the United States that do not want him to change the existing foreign student policies. STUDENT VISA SUMMARY: Based on statements Donald Trump made about foreign students, and his policy for student visas, it is likely that his policies won’t affect students ability to get F-1 and M-1 visas in the United States, or their TOEFL requirements. This area is a little more “tricky”. Donald Trump and the TOEFL might not be an issue for students that want to attend University in the United States, however he has stated in his immigration policy outline that he plans to reform the HB-1 visa program to promote more jobs for American citizens. If you plan to come to the United States for employment with an HB-1 visa, you should submit your application AS SOON AS POSSIBLE. The new Trump administration might change the conditions and availability of the HB-1 visa program. If you are taking the TOEFL as part of a requirement for a professional license, it is possible that new laws Trump creates could affect your plans. WORK VISA SUMMARY: Donald Trump and the TOEFL is an issue for you if you are taking the exam to complete a professional licensing program, and plan to work in the United States. Because of this you should apply as soon as possible for your HB-1 visa, and get your required TOEFL score as soon as possible. First, don’t panic! Many people – especially in the United States – are disappointed with the results of the U.S. election, and worried about how it will affect them. Donald Trump will probably NOT do MOST of the things he said he would during the campaign. In addition, the United States government and its laws take a long time, sometimes years to be changed. In elections and campaigns, many politician make promises to get votes, and then when they become president they realize that they have to work with the governent, and have to compromise. Don’t be concerned about any laws or changes until they actually happen. As an American, I personally think that immigrants are the foundation of my country. And, if you want to come to the United States and build your life here, it’s a part of YOUR country too. If you are concerned about this election, and how it will affect your future in the U.S., please reach out to us at English Simple TOEFL with any questions. TOEFL is our business, but helping people achieve their dreams is our passion, and that means we are here to help.